Mikayla Miller drive towards the basketball against DePauw. 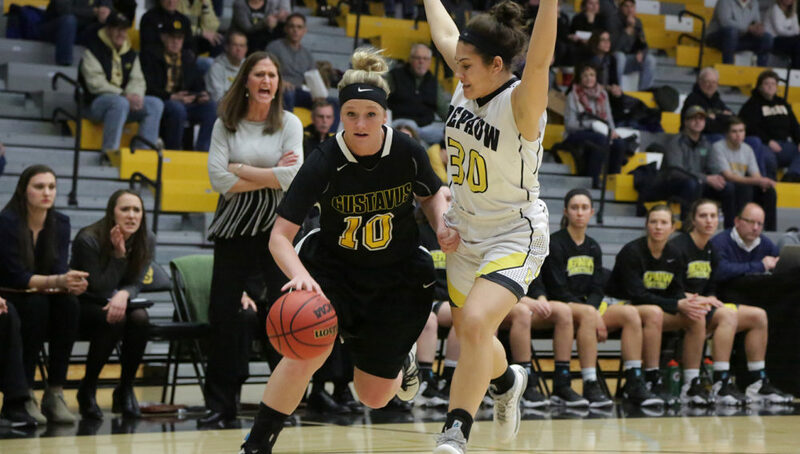 OSHKOSH, Wis. – The Gustavus women’s basketball team fell in the first round of the NCAA Tournament Friday versus DePauw University, losing by a score of 67-57. The Gusties end their season with a 25-3 overall record after making their sixth appearance in the NCAA Championships. Gustavus shot 6-for-15 in the opening even paced first 10 minutes and led DePauw 15-13. Two minutes into the second quarter, Gustavus maintained its two-point lead before the Tigers took over and disallowed any Gustie offense for the remainder of the second half. DePauw outscored the Gusties 17-9 to take a 30-24 lead into the locker room at the halftime break. After the first 20 minutes, Gustavus shot 10-for-26 from the field and struggled from beyond the arc, going 2-for-11. Hannah Howard (Sr., St. Paul, Minn.) was the first half leader with eight points, going 3-3 from the field along with sinking her second three-pointer of the season. Gustavus began the second half on a good note, beginning on a 9-2 run and taking a 33-32 lead midway through the third quarter. DePauw answered, going on a 13-5 run to take a 46-37 lead heading into the final 10 minutes. While the Gusties had a strong push back in a back and forth final quarter, outscoring the Tigers 21-20, they weren’t able to come within six points of DePauw as they held its lead in the final frame to close out the game. The Gusties owned a 30.3 percent field goal percentage in the second half, going 20-for-59 (33.9%) in the game. A balanced scoring output left Gustavus with four players posting double-digit scoring performances. Justine Lee (So., Dawson, Minn.) led the way with 13 points, Miranda Rice (Jr., Forest Lake, Minn.) recorded 12, while Hannah Howard and Mikayla Miller (Jr., Goodhue, Minn.) each added 10. Although the points in the paint play was even, Gusties leading by a margin of 30-28, Gustavus was outmatched on the glass. DePauw out-rebounded the Gusties by a margin of 45-28 in the game, proving to be a factor in the loss. Gustavus closes out the 2016-17 season with one of the best teams in program history. The Gusties were just one win away from posting the most wins in a season in school history, coming up short with 25.